And…cut! DEADLY REVISIONS leaves the editing room and heads for remaining post-production! 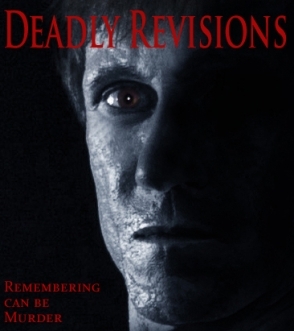 Gregory Blair’s mystery/thriller DEADLY REVISIONS—starring international sensation Bill Oberst, Jr.—is moving forward with post-production, aiming for a Halloween premiere. LOS ANGELES - May 2, 2013 - PRLog -- The independent feature DEADLY REVISIONS—a twisted tale of terror from PIX/SEE Productions—has finished the edited process and is moving into sound, score, fx and colorization. In the widely anticipated DEADLY REVISIONS, Bill Oberst Jr. (Best Actor, Shockfest 2012) plays an amnesiac horror film writer for whom hypnotherapy and nightmares reveal memories that might or might not be real…and that might or might not be deadly. The film’s twisted blend of mystery, psychological thriller and horror is tasty fodder for fans of numerous genres. But each phase of the project has been blessed with such success: the screenplay was first a finalist in a past Horror Screenplay Contest; then, the teaser trailer for the film was honored with a screening at the New Media Film Festival last year, thanks in part to the team at FilmBreak.com. In fact, director Gregory Blair has already been nominated for an EOTM Award for his work on the film. Fans can keep posted via the official DEADLY REVISIONS website, Facebook and Twitter. And, if that isn’t enough, fans can claim their own piece of the action: for a few bucks, folks can get their name associated with the film on the official website or on IMDB; they can actually be a producer, get a piece of movie swag—even get invited to the premiere! The DEADLY REVISIONS website-- http://www.DeadlyRevisionsMovie.com-- is set up to make that happen. “We could use any dollar amount to help pay for the post-production costs, so join us and be an accessory,” Blair offers. “It’s an opportunity to die for!"